Pismo Beach, CA. Photo taken with my iPhone. Our lives can change in an instant! Four weeks ago today, my wife Dallis had surgery for a tumor that was discovered on one of her ovaries. The surgeon was fairly confident going into surgery that the tumor was benign. There had been no symptoms, and the only reason it was even found was because of an MRI done for a completely different medical condition. I was the first person to receive this life-altering news, and for several moments I simply tried to catch my breath. Dallis was not yet alert enough to be told. She and I had both been encouraged by the doctor’s gut instinct before surgery that the tumor was benign, and at the same time I think we both retained a cautious concern that maybe it was not. Speaking for myself, throughout this ordeal I have preferred to hear facts first and then decide how to process my feelings, instead of hopping on board the already bumpy roller coaster ride of speculation. A lot happens very quickly when a person receives a diagnosis of Stage 4 breast cancer – PET/CT Scan, MRIs, blood work, mammogram, biopsy, and more. Dallis attests that she has begun to feel like a guinea pig because of all the poking, prodding and invasions of privacy. Most of the doctors and nurses have been wonderful – caring, sensitive, responsive to individual needs, and good at communicating human warmth. Even so, the indignities of constant medical procedures and a disease that invades one’s body eventually take their toll. I have not written anything for my blog in the intervening weeks because my focus has been on being present and available to Dallis. Close friends, family, and our church have also provided practical support and caring. Our mental/emotional/spiritual wellbeing hinges on being able to recognize our blessings and to believe in the healing potential of the prescribed treatment. There are moments though … moments when fear grabs hold of you and you’re not sure how to shake it! The other day Dallis wanted to get out of the house but she didn’t want to ask me in one of the busiest weeks in the church year to go with her. So she said that she was going to drive to the beach and take a walk by herself. I didn’t want her to have to go alone unless that was what she preferred, so I said to her, “There is no more important place for me to be than with you.” I assured her that I was okay with her going by herself, but that I didn’t want her to think that she couldn’t ask me or that I wouldn’t want to go. 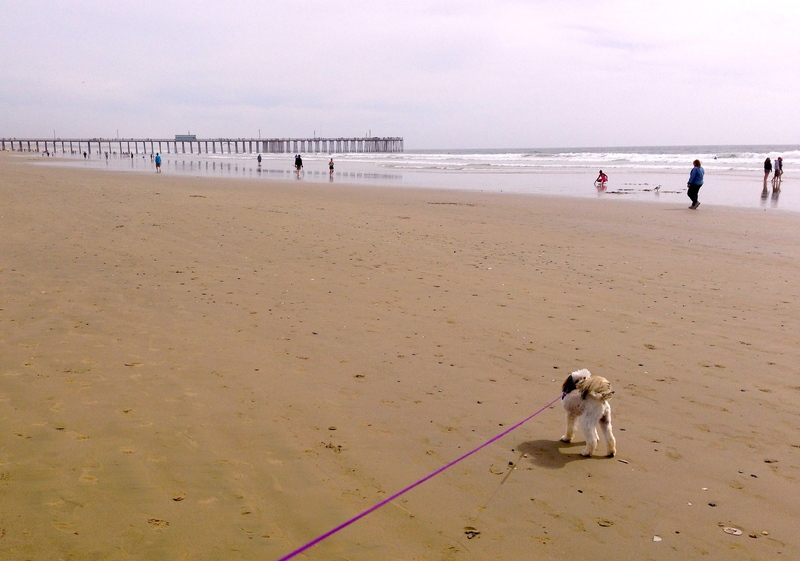 So together we enjoyed a long walk on a stretch of beach with our dog Bailey! It was a reminder that each day is to be prized for the gift that it is!